I'm trying to build an air pollution sensor for a college project, with an Arduino Due and a series of Spec Sensors digital gas detectors. However, I'm having a little trouble getting the first one of them (Carbon Monoxide, https://www.spec-sensors.com/product/digital-co-sensor/) to behave, before I can run multiple. As they're all the same sensor setup but for different gasses, once I get the first one working, the rest should follow easily. Right now, all I want is the reading in ppb (the second value), either as the only data coming through or being stored, so that it can then be used in calculations like averages per hour. The trouble I have is that this information appears to be coming through as a stream of individual bytes, and in this format I'm having difficulty working out an effective way to specify which information I want to store, and which I want to ignore. 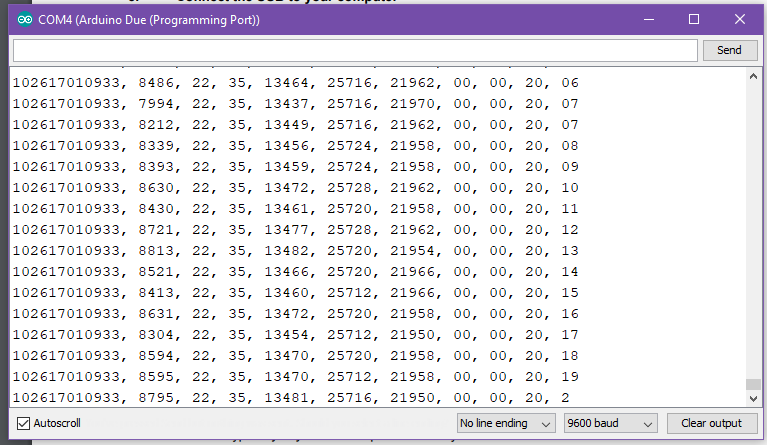 I've been trying, for example, to come up with a way to specify that the first 14 bytes (serial number, comma, space - as this will always be the same length) should be ignored, and then the next series (up until the next comma - as this reading could be 4-6 digits) be stored as an int, or something, but I just can't seem to get anywhere no matter what I try. Does anyone have any suggestions? Since the length of each data varies, you should extract data using spererator like comma in the stream. First, get one data line from sensor. Read the string until the "Line feed(LF)" character or "Carriage Return(CR)" character appears. located at the end of line(EOL), these two characters seperates each string by changing line. Without these two characters, the monitor shows the stream like this(no line change). Lastly, utilize the data and repeat whenever sensor sends the data. I'm not expert at coding. I haven't tested the code below. But this code would be helpful. Serial.println(data); //just example code. You may see ppb on the serial monitor. Not the answer you're looking for? Browse other questions tagged serial sensors arduino-due serial-data or ask your own question. How I can divide information stream from bluetooth hc-06?